Start with your rice. Wash it, set it in the rice cooker or on the stove, and cook following the package or rice cooker instructions, and leave alone to steam until the end. 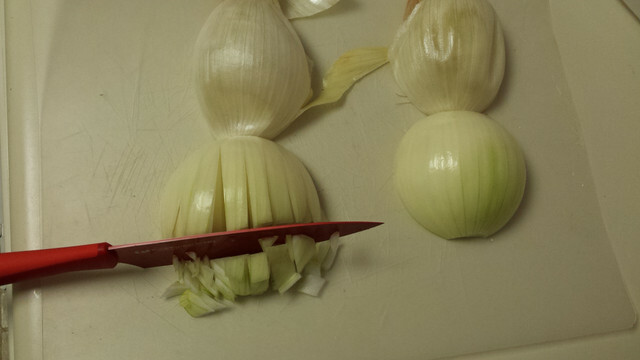 Then, start with your onion. This technique of cutting the onion is introduced in the anime, but I don’t think was exemplified very well. I’ve taught you this technique before in the Chaliapin Steak Don post, but I’ll go over it again. Slice in half end to end, so that your cut goes through the root and up the top. Then, peel skins back against the root. 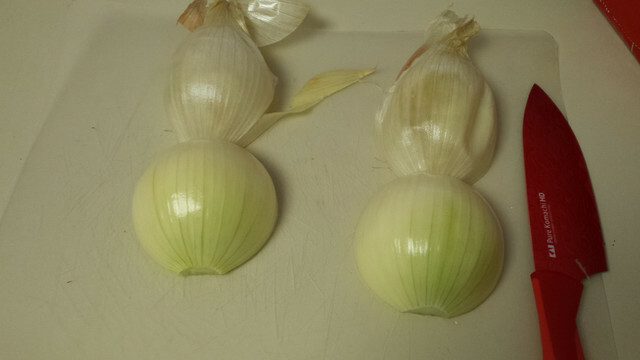 Make a series of vertical slices through each onion half. Do not cut all the way through the root- leave it connected by about a half inch or shorter, if you can manage. 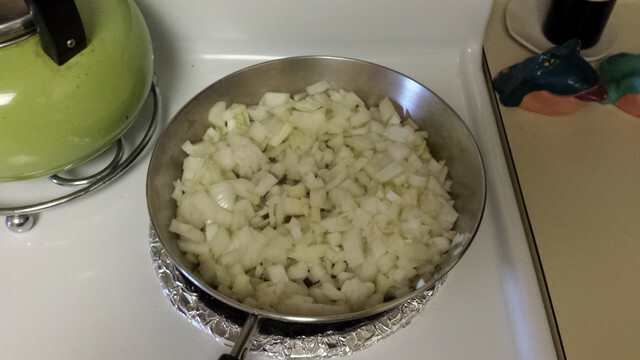 Then, make a series of horizontal slices through the onion (I normally get around 3-4). 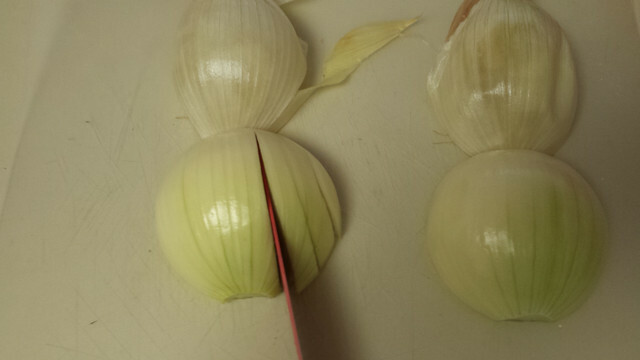 Then, slice across the onion, starting at the top and working your way down to the root, in about 1/4 inch sections, creating little pieces of onion. Magic! Once chopped, heat a pan over medium-low heat with about a teaspoon of olive oil. 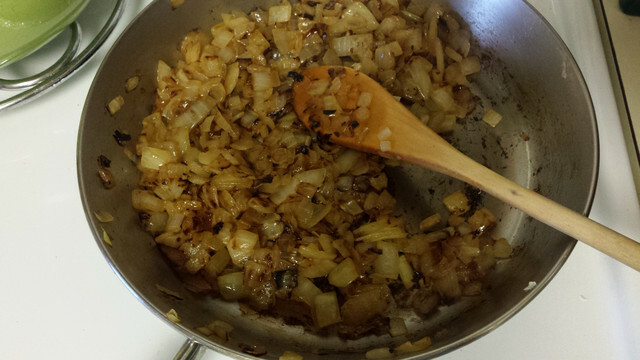 Once warmed, pop your onions into the pan. Let those heat for a good 15-20 minutes, stirring them around a bit once every few minutes. You want the sugars to caramelize, so make sure you don’t put the heat on too high! To be done right, this step has got do be done slowly. Don’t rush it. We are aiming for a wonderful caramel color in the oinions. 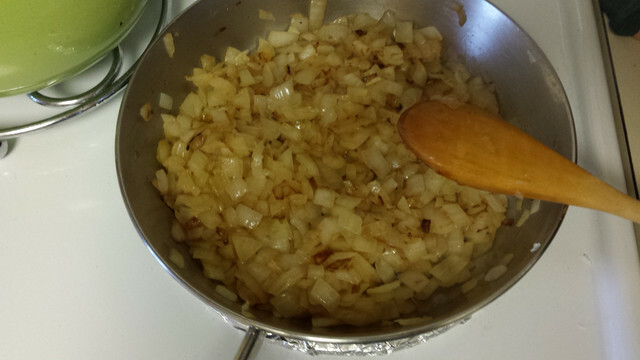 Keep stirring the onions around every few minutes. 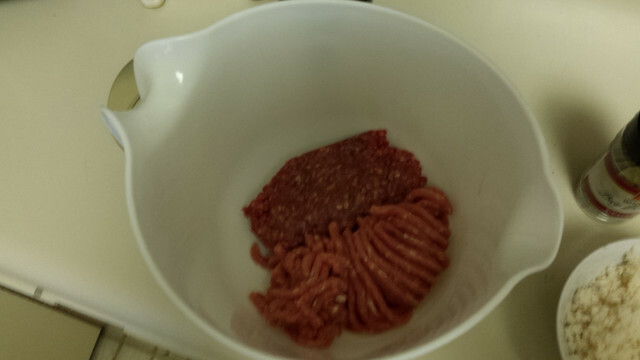 Place ground beef and pork into a bowl. A little charred, but otherwise a nice color. Save half for later in a bowl, add the rest into the meat mixture, then stir the entire thing together very thoroughly. 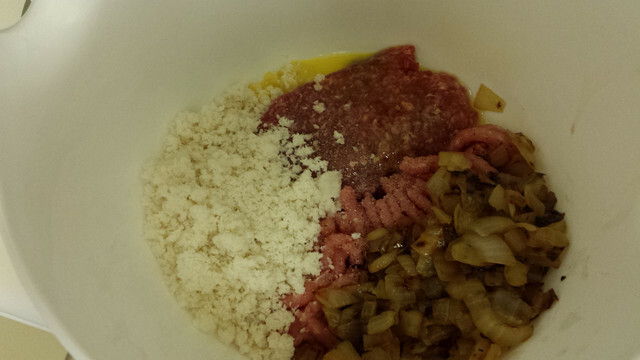 Split the mixture into thirds and form patties. Just like in the anime, once you divide the meat up, you should really slap it around to make sure all the air is out and the fats are evenly distributed. 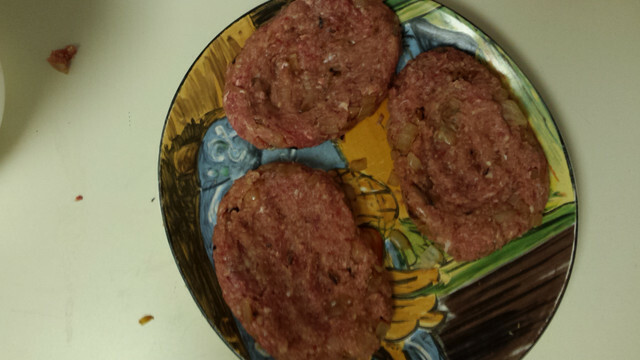 I took a plate and just slammed the meat down onto it until I was ready to form it into a patty. It was really fun. Do recommend. Make sure to dent down the middle of the patty so it’s thicker on the sides. This will help prevent shrinkage. Edges should be nice and rounded with no cracks. In the same pan you used to cook the onions, heat it up to medium high heat and add a healthy splash of oil to the bottom of the pan. When it’s heated up, place the steaks down and let cook about 3 minutes each side. We’re just trying to brown the patties, not cook them all the way through, so once you have nice coloring on one side, you can flip it. Once those are nicely colored, take them out and place them on a plate to chillax. Turn the heat down to low and make sure your pan actually cools off before doing this next step. To help, take the pan off the burner and wave it around gently to let the air cool it (For the love of all things delicious, don’t accidentally brain someone). 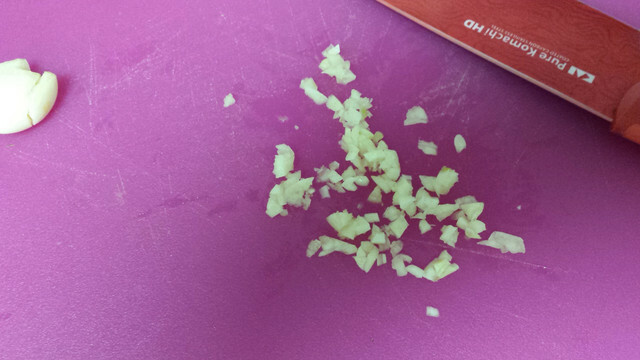 Quickly mince some garlic (you can actually do this by following the same steps we used to chop the onion, or you can just go crazy and chop the living daylights out of it until the garlic is in small pieces. Or you can use a garlic press, those are fun.) 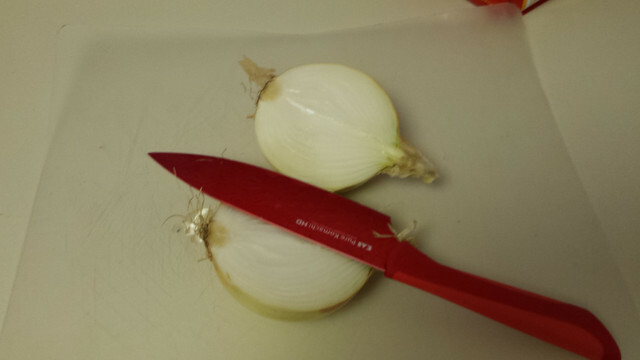 I like to take the root end off, smash the clove beneath my knife, remove the skin, and then chop the living daylights out of it. 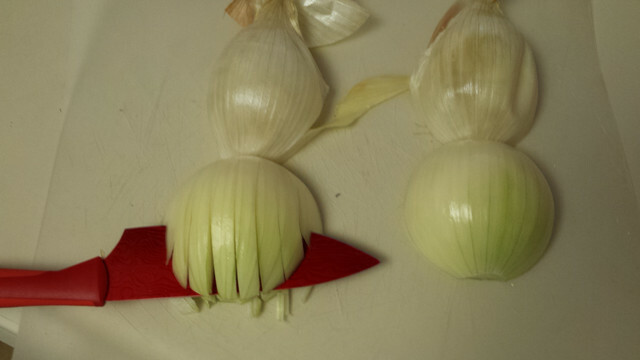 If you like garlic, I recommend upping the clove count to two instead of one. Open your can of chopped tomatoes in preparation. 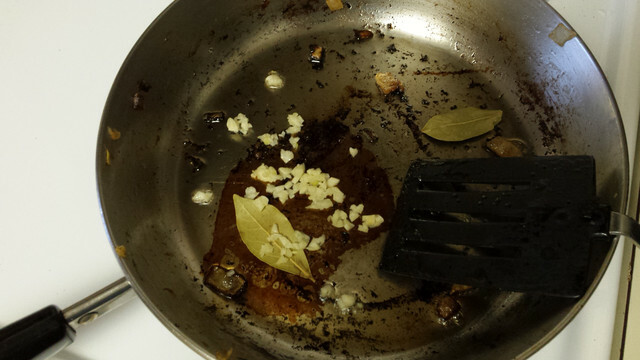 When the pan is ready, pop the garlic and two bay leaves into it and let them gently warm through. If your pan is too hot they will burn in an instant and smell terrible. So please, low heat is the best here. Once the smell of the garlic and bay leaves is nice and strong, about 30 seconds to 1 minute, dump in the can of tomatoes and mix it up. Up the heat to medium-low. Take out your bullion cube. I thought mine was big, so I decided to start with 1/2 of it. After taste tests, I decided to add about half of the remaining cube. 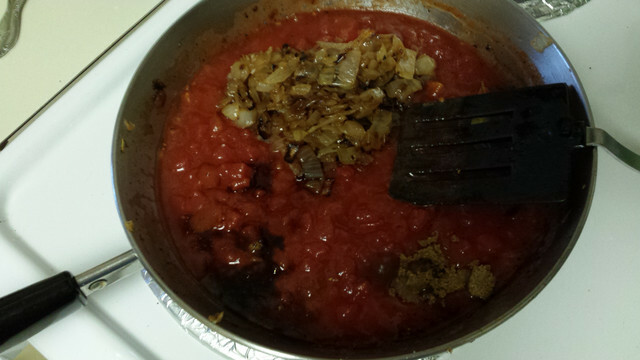 Crumble your cube into the tomato, dump in the onions you set aside, and add in worcestershire sauce as well. Mix it all together and let it cook about 5 minutes. Taste test to make sure everything is to your liking. Feel free to add in salt and pepper, as well as extra bullion or worcestershire sauce, depending on what you like. For me, I always have to make sure the dish is salted correctly, but tastes may vary. So, experiment! Taste testing is good. 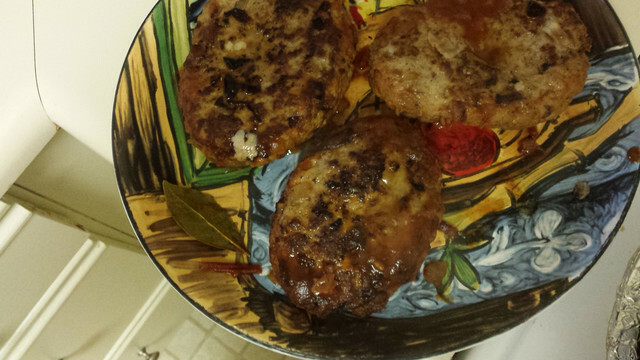 Once thoroughly heated and the flavors have had a chance to mingle, add the patties back in. Cover with a lid and let cook about nine minutes. While that’s cooking, time to cook the egg for the top. I went over this technique in my Space Patrol Luluco article, but here are the basic steps: Get out a small pan and turn heat on to medium-low. Add in some olive oil so the egg doesn’t stick. Once heated, crack eggs into a pan. I just made one because I was eating alone (cry) but if you’re cooking for others, you may as well do them all at once. Cover the egg with a tiny bit of water to help the white on top cook all the way through. 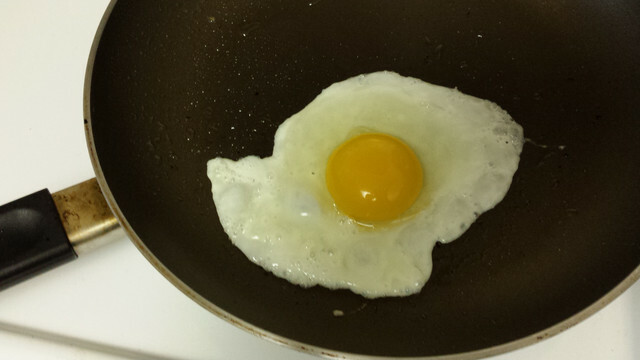 Don’t leave it on too long or the yolk will start to cook too, and we want it really sunny-side-up. Let the egg hang out about 4-5 minutes. 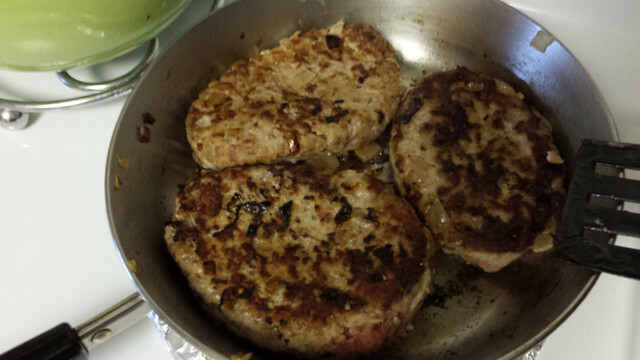 On a low heat, it can cook alongside the patties until the meat is ready. You’ll know it’s done when edges of the egg start to crisp up a little and the white isn’t translucent on top but is actually white. When everything is ready, it’s time to plate. Portion rice out into a bowl. 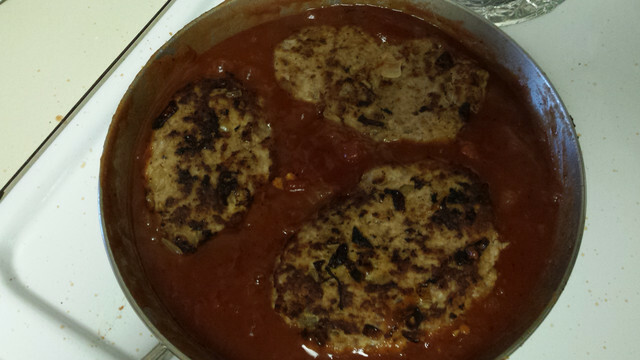 Take patties out of the sauce and remove the bay leaves. They are not fun to eat! I actually couldn’t find one and later discovered it was hidden under a patty I’d taken out (reminding me suspiciously of Bubble Bass and the hidden pickles from an episode of Spongebob). Be careful you find ’em all! Let the sauce simmer away for a minute or two to thicken up more. Then, when you are mentally prepared to taste the most amazing hamburger steak of your life, place some sauce on a plate. Place a patty on top, and cover with more sauce. Then, slide the egg carefully onto the top of the patty. Wondering what it tastes like? Magic. Pure, unadulterated food magic. It brought tears to my eyes because I was STARVING and this was really, really good. 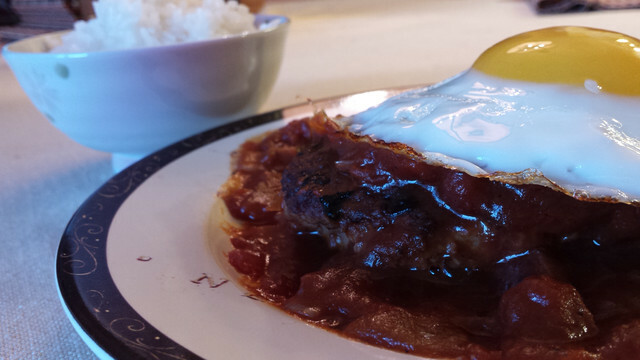 Actually, hamburger steak basically tastes like meatloaf, but I happen to love meatloaf, so it works for me. The mixture of meats makes it really tender and tasty, and the sauce has a wonderful body of flavor that compliments the meat well. The egg on top… well… I hate eggs. I could handle some eggs in Japan, but this one tasted funny to me. I tried really hard to eat this one, but I couldn’t do it. 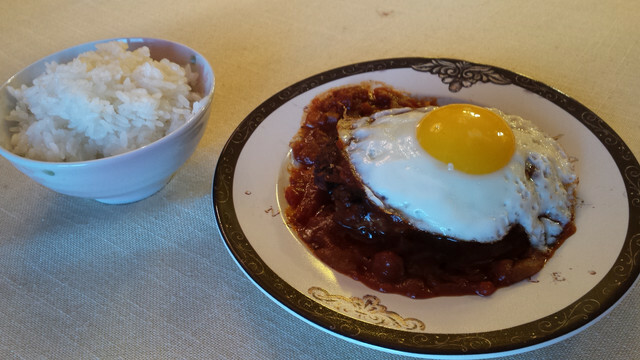 However, if you happen to like egg on meat, which is a really popular way to eat meat in Japan, you will enjoy this a lot!